Belle in the City is a DIY + Lifestyle blog about fashion, beauty, and everyday life, all with a Southern flair. This blog is catered toward women in their twenties, thirties, and up. Featured posts highlight fashion and beauty content, recipes, as well as do-it-yourself crafting and decorating posts. I have had the opportunity to work with numerous brands and have curated various sponsored/affiliate posts on behalf of these companies. 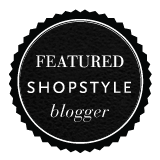 I'm also thrilled to have been featured on assorted media outlets, such as AOL Lifestyle Collective, POPSUGAR Select Fashion, Lucky Magazine Community and Shopstyle Collective.